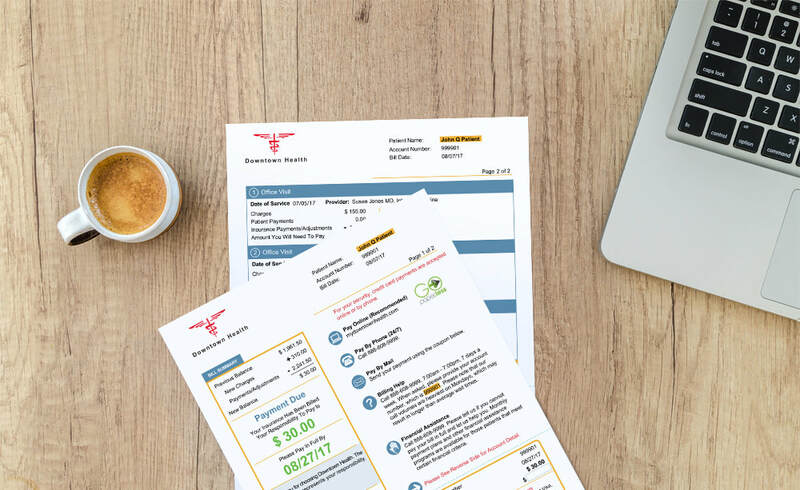 ​Blackhawk designs and delivers billing statements for healthcare providers. Our clients see reduced billing costs and increased patient revenue through fewer statement cycles, consolidated statements, and decreased call center volumes - all while ensuring a better patient billing experience. Safe, secure, and cost-effective, we’ve been creating a better billing experience since 1995. We understand that a negative billing or payment experience can damage the patient-provider relationship. We’re here to help. We are a recognized industry leader for PB, HB, and SBO formats for a wide range of billing services that use EPIC and GE. We design for your organization, offering best practices in traditional billing and expertise in setup and integration for online patient portals and payment solutions. Paperless bills are viewed and paid quickly and easily. Billing costs decrease and patient satisfaction increases without having to change your billing software or design. Full color, edge-to-edge printing with digital press technology allows for easy changes and ad hoc communications. Extensive quality controls ensure zero-defect production. Keep your current statement format or let us create one that best fits your organization’s needs and changing patient preferences. We design and build your billing statement. The same team facilitates implementation and offers ongoing support. That means we can offer seamless troubleshooting and expedient results. Patient privacy demands the best in security. We are HIPAA, HITECH, SOC, and PCI compliant. Redundant facilities provide additional disaster protection and recovery. Copyright © 2018 Blackhawk Statement Group. All rights reserved.